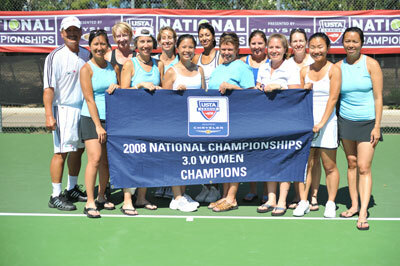 TUCSON, AZ - OCTOBER 5, 2008 - The women’s team from Seattle, Washington, representing the USTA Pacific Northwest Section, captured the national title at the USTA League presented by Chrysler 3.0 Adult National Championships held at the Randolph Tennis Center in Tucson, Arizona. The Seattle team defeated a team from Redding, Calif., 4-1 in the Championship match. Earlier in the day, the Seattle team defeated a team from Clifton, N.J., 4-1 in the semifinals. They advanced this far by winning their round-robin flight contested Friday and Saturday. The team is coached by Roger Mark and captained by Diana Vecchio and features Maiko Winkler Chin, Jessica Young, Terri Murray, Danna Baer, Yao Chen, Bernadette Cuyugan, Stacia Wyman, Suzanne Johnson, Betsy Alexander, Skye Schroeder, and Kathy McCann and plays at the Nordstrom Tennis Center. The top four teams in order of finish are: Pacific Northwest (Seattle, Wash.), Northern California (Redding, Calif.), Eastern (Clifton, N.J.) and New England (Winchester, Mass. ).